Happy New Year—2017 is here! College football will have a new champion tonight, college hoops is in full swing, and we are now 9 days into the new Quality Payment Program. Time flies when you are having fun, right? I am sure the vast majority of you have had your fill of MACRA related blog posts, but I could not resist just one more pass, particularly one involving an old friend of mine, the Meaningful Use Hardship Exception. With the arrival of the New Year, the need to formally worry about things like Meaningful Use, PQRS, and the Value-based Payment Modifier no longer exists as those 3 programs have ridden off into the proverbial sunset. Don’t misunderstand, in order to avoid the 2018 penalties that plague the first 2 programs, many of you are still compelled to report or attest for the work you’ve done in 2016. But starting January 1, 2017, moving forward is all about the Quality Payment Program and our new friends MIPS and APMs. However, to set the stage for our conversation today, we need to go back in time—back to the beginning of the Meaningful Use program, cleverly referred to as the Medicare and Medicaid Electronic Health Record (EHR) Incentive Program. It’s been almost 8 years to the day—in February of 2009 interestingly enough, just after the Inauguration of a new POTUS—that the American Recovery and Reinvestment Act (ARRA) birthed the Meaningful Use program. Ring any bells? In 2011, many of you pioneers tilted your shoulder against the Stage 1 MU objectives, and collected a handsome bonus for your efforts. Buried in that original final rule was an obscure fact, which effectively stated that in order to participate in the program and collect the lucrative Stage 1 MU bonus, at least half of your outpatient encounters had to occur in a venue of care equipped with CEHRT. This little tidbit would later prove to be very important to nephrologists, many of whom spend a lot of time making rounds in a dialysis facility, or performing procedures in an access center. Dialysis facilities, along with ambulatory surgery centers and post-acute facilities were left out of the meaningful use framework and, as a result, the vast majority of those venues of care were not equipped with CEHRT. In 2012, anticipating that a lack of participation in the MU program during CY 2013 would result in a 1% reduction in the provider’s Medicare Fee Schedule in 2015, CMS first published the Meaningful Use Hardship Exceptions, including one the Acumen blog labeled “the 50% Rule”. Over the past few years, literally thousands of nephrologists have appropriately used the 50% Rule to step out of MU without incurring a financial penalty. Recall, this MU hardship exception basically states that if more than half of your outpatient encounters occur in a venue(s) of care not equipped with CEHRT, and the decision to deploy CEHRT in that venue(s) is beyond your direct control, you are eligible to file for the hardship exception. Fast forward to today. What does MACRA think about this hardship exception? Well my friends, buried in the final rule, and recently confirmed by my colleague Diana Strubler, is some very good news for nephrologists. Advancing Care Information (ACI), the “new” MU program that makes up 25% of your MIPS score, has basically rewritten the book on what a “significant hardship” looks like. The focus today is on our old friend the 50% rule, but those of you with docs who spend more than 75% of their time in the hospital will want to take a close look at how they’ve redefined “hospital-based” physicians. “Lack of Control over the Availability of CEHRT” has returned for the ACI category of MIPS. As before, if more than half of your outpatient encounters occur in a venue of care not equipped with CEHRT and you do not control the decision whether or not to deploy CEHRT in that venue, you may submit an application stating this is so; and, if approved, CMS will reweight the ACI category of MIPS to zero. You should recognize that when ACI goes to zero, the remaining three categories increase in weight. Given the large weight the Quality category already has, voluntarily increasing Quality’s contribution to your MIPS score should be done cautiously, but the option is yours. The good news here is the requirement to participate in ACI is no longer contingent on the majority of your outpatient encounters occurring within a CEHRT-equipped venue of care. That dinosaur from MU is now extinct. The ACI Hardship mentioned above is in place because CMS recognizes there are providers (like a primary care doc whose practice is confined to seeing patients in a nursing home, or the surgeon whose practice is restricted to an ambulatory surgery center) who literally cannot fulfill the ACI objectives due to site-of-service constraints. Those providers can apply for the hardship and reweight ACI to zero. Nephrologists who have more outpatient encounters in a dialysis facility than they do in the office may also apply for this hardship if the dialysis facility is not equipped with CEHRT and the nephrologist does not control the decision whether or not to deploy CEHRT in that facility. However, the hardship is merely an option. That same nephrologist can elect to report the ACI objectives based on the encounters he or she has with the patients seen in the office setting—the venue of care where a certified ambulatory EHR is intended to be used in the first place! 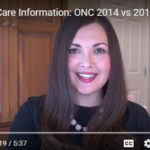 Description: In the MACRA final rule, I do not see the same rule to be eligible for advancing care information that existed in the previous meaningful use framework in regards to 50% of encounters must take place where there is a certified EHR equipped. If I am a clinician (and I see more than 50% of my encounters where there is NOT a certified EHR equipped) AND I do NOT want to take the hardship, can I still submit data on behalf of advancing care information for the patients that I did see with a certified EHR? Yes, because the submission requirements are different between Medicare Meaningful Use and the ACI category of the new MIPS program, an eligible clinician could submit the information that they have in their certified EHR system to CMS for the ACI category. The numerator and denominator (or yes/no attestation, depending on the ACI measure) that they submit to CMS for a given ACI measure should only contain those patient cases that have been documented using a certified (CEHRT) EHR system. Think about this for a moment! Remember the days when we dragged our office-based CEHRT into the dialysis facility, and duplicated data entry in order to satisfy the Stage 1 MU objectives? That’s now a distant memory. Today, you have a choice: file for the hardship and reweight ACI to zero (at your peril in my view), or simply report ACI based on the work you accomplish in the office setting with your CEHRT. There’s a subtle but important distinction here. With MU, the hardship provided a way out of the entire program. In MIPS, the hardship removes your obligation to report ACI, but you are still in MIPS and reweighting those remaining MIPS categories may well be problematic for you. While many of you may elect to press the easy button during this transitional year, those who plan to make a full run at MIPS will be able to do so using office-based CEHRT the way it was originally intended to be used. And that should be very refreshing news for the New Year. Are you planning to report ACI this year? Drop us a note and join the conversation. Have you seen this post regarding PQRS in Modern Healthcare? Should we enter 2016 data in PQRS even though they are stating that there will be no penalty in 2017 and 2018 for 2015 and 2016 submissions? Thoughts? The CMS issued something of a get-out-of-Medicare-penalties-free-card for two years to physicians and group practices due to a glitch with quality reporting measures based on a recent update to the ICD-10 diagnosis and procedure codes. The CMS pointed its finger at updates that went into use Oct. 1, 2016, to the ICD-CM (Clinical Modification) and ICD-PCS (Procedural Coding System) and their impact on the Physician Quality Reporting System. The updates “will impact CMS’s ability to process data reported on certain quality measures for the 4th quarter of CY 2016,” the agency said in a statement posted on its website. Joseph Conn reports on information technology, privacy and data security. He has been a reporter and editor for 35 years for various news publications and taught journalism at Valparaiso (Ind.) University, where he earned his bachelor’s degree in English. He also worked as a Peace Corps volunteer in Sierra Leone. Conn joined Modern Physician in 2000, serving as reporter, editor and online editor. He joined Modern Healthcare in 2005. I am happy to help with this one. The glitch you mentioned was not brought up in the CMS hosted monthly PQRS registry support call; therefore we would not advise you to skip PQRS 2016 reporting because of the referenced “glitch”. Keep in mind that PQRS reporting in 2016 is also shielding you from the VM penalty in 2018. Please feel free to contact me directly, if you have further questions. Thank you for the great article. Have you found anything in MACRA regarding hardship due to changing EMR’s? Our organization is changing in March of 2018 and it will drastically effect our data. Yes if you switch EHRs mid year my understanding is you can basically file for what used to be called a Hardship Exception in the meaningful use program. I believe changing EHRs mid year falls under the “extreme and uncontrollable circumstances” category. Note that when you do so, your 25 ACI points will be reassigned to the MIPS Quality category (significantly over weighting Quality for you in 2018).